Introduction – Vallam is small settlement near Chengalpattu where three rock-cut shrines are excavated in a hillock, running north to south.Cave Temples at Vallam – On the eastern face of a hill are carved three rock-cut shrines. Two caves are on same boulder one above the other cave, while the third is located little north of the previous ones. We will discuss each in detail in this article. Cave No 1 – This is the uppermost rock of this hill. It has been closed on all sides with iron grills as the cave is still in use as a live temple. When you plan to visit, please visit early in the morning or early evening as usually temples are open about this time. The front façade of the cave is supported in two pillars and two pilasters. This arrangement divides the cave into three openings as seen in many earlier caves of we have seen as Mandagapattu, Dalavanur, Kuranganilmuttam, Mahendravadi, Mamandur Cave 1 and Seeyamangalam. Both pillars and pilasters are differentiate into cubical top and bottom (saduram) and octagonal middle part (kattu). There are two inscription on the front top cubical faces of the pillars. The corbels are curved, however curve is not very prominent so this looks like in angular profile. As also seen in other caves of the same period, this cave also has two rows of pillars and pilasters, hence partitioning this into ardha-mandapa and mukha-mandapa. There are two small niches, beyond the pilasters of the front row. These niches are not aligned with the cave, so it looks that these were excavated later after excavation of the cave. We will see some more arguments to support this in below paragraph. The niche of southern side has an image of Ganesha. As his trunk is turned to his right so it is Valampuri Ganesha. He is seated in simhasana, and his one hand is resting on a small platform on his left side. He is depicted with four hands, in upper left is a broken lotus stalk while the upper right hand attribute is not very clear. His lower right hand is resting on his thigh. The overall sculpture is graceful with good proportional ratios. On northern niche is a very worn out image of Jyestha. She is shown seated on a platform with her legs down on the ground. She is wearing a conical makuta. Her usual two companions are missing in this image. If we take only those Pallava monuments where we have their inscription to support this, also the whole of Mahabalipuram, then we see that we never encountered either Ganesha or Jyestha. We see Ganesha and Jyestha both in Kailasanatha Temple, Kanchi, hence in the time of Rajasimha. One more instance of Ganesha is seen in Ramanuja Mandapa at Mahabalipuram where he is shown along with ganas of Shiva, perhaps represented as Ganapati. Keeping this fact in mind, we may say that perhaps these two niches and the images inside these were executed after the cave was excavated. On the back wall of the cave is cut a cell in the center. There is a pair of dvarpalas at the entrance, while inside the cell is placed a Shiva lingam. The top and bottom part of the lingam is made of separate stones, and it is assumed that perhaps this was place after later on. The door jambs of the cell are plane cubical throughout. There is a Nandi, installed opposite to this shrine, facing it. This Nandi, out of single stone, would have been placed as a later addition only. The most of the cave is painted, hence many of the original features are hidden below this paint surface. Dvarapalas of the cave – The dvarapalas of the shrine can be rated as the best among all the contemporary caves of Mahendra’s time. They clear show the characteristics of the Shiva ayudha-purusha, trisula and parasu. The dvarapalas are carved in relief in the niche, formed by pilasters, at the entrance of the central cell. The Dvarpala on southern side is shown standing in tribhanga posture, with one hand on his waist and other one is resting over his club. The massive club is on his left side, its handle is almost into his left armpit. The club is entwined with a serpent. Dvarapala is wearing huge patra-kundalas, keyuras, valayas, necklace, and yajnopavita. He is standing slightly turned towards the shrine with cross-legged. Behind his makuta are two protruding prongs of trisula, which suggests that this dvarpala is ayudha-purusha representing trisula of Shiva. The dvarpala on northern side is similar in posture as of the previous one. Instead of entwining around his club, the serpent is seen entwined around his body. The interesting feature to notice is the protruding axe-blade out of his makuta, which represents the ayudha-purusha character of parasu, a weapon (ayudha) of Shiva. So we find here both ayudha-purusha of Shiva guarding the shrine. Till now this is the only cave in which we have noticed these both ayudha-purusha. Please visit Poetry in Stone for more information on ayudha-purusha dvarpalas. Inscription in the cave – There are three inscriptions in this cave. Two inscriptions are in early Tamil Pallava and third one is later Tamil probably of the Cholas time. We will discuss these in detail here. Inscription 1 – This single line inscription on the south pillar upper cubical face gives two titles of Mahendravarman. This inscription is written in early Tamil, engraved in Pallava Grantha script. 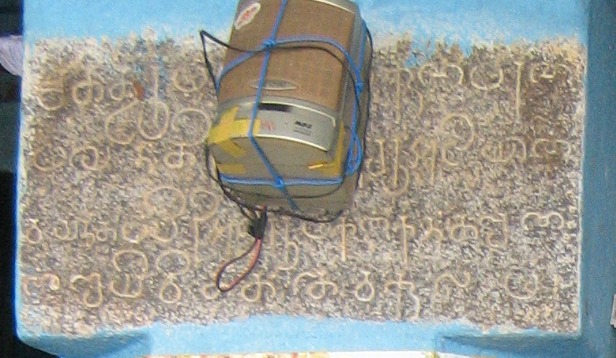 Inscription 2 – This four line inscription, written in early Tamil, engraved in Pallava Grantha script, is on the upper face of the north pillar. Both the inscriptions, 1 and 2, are to be read in continuation for the translation. Translation – Kandasenan (Skandasena), the son of Vayandappiriaresaru (Vasantapriyaraja), the servant of Pakappidugu Lalitanguran (Lalitankura) Chatturummallan (Satrumalla) Kunaparan (Gunabhara) Mayentirappottaresaru (Mahendrapotaraja), caused (this) temple (devakula) to be made. Inscription 3 – This inscription, in Tamil, is engraved on the lower face of the southern pillar. This is a thirteenth century inscription of Kopperunjingadeva. Abstract – This inscription records a gift of a lamp in the fourteenth year of Sakalabhuvana-chakravartin Kopperunjingadeva (Ko-Perum-Simhadeva) to the temple of Vayandisura (Vasanteshvara) at Vallam in Valla-nadu, (a sub-divison) of Kalattur-kottam. We have few inscriptions of the same king, Ko-Perum-Simhadeva, at Arulala-Perumal temple at Kanchi, Chidambaram, Tiruvidaimarudur and Draksharama. From these inscriptions it is inferred that this king ascended the throne about Saka samvat 1165-66. Kalattur, present Kalatur, is a large village near Chengalpattu, this is also a railway station. Tirukkarukunram was also in Kalattur-kottam as per an inscription there. Cave No 2 – This small cave is excavated below the first cave, on the same boulder. The present cave is not under worship, This simple cave has no pillars to form a mandapa. A cell I directly cut into the back wall, and the wall is used to form niches to carve out dvarpalas. The oblong entrance led into the cell which has a Shiva lingam installed. The dvarpalas are very much worn out, and as no care has been taken up so it ruining further. There is a Ganesha image, on southern side, beyond the dvarpala. Ganesha is shown seated over a lotus, his trunk is turned to right so depicts Valampuri Ganesha. A similar Ganesha is also seen in the above cave. The excavation of this cave seems to have been carried out quite later compared to the above cave. As this cave also has a Ganesha and above cave as well, so it can assumed that when this lower cave was excavated, they also carved out the relief sculptures on the above cave. However, when there is a cave above, will you take risk of excavating another cave below thus risking the above excavation as well? This point needs to be taken care of when we assign this cave to a later period compared to the above cave. I am not a student to architecture and material science hence can’t comment on this. I would like to hear your thoughts on this, let’s see if someone can clarify this doubt. Dvarpalas of the cave – There is a pair of dvarpalas at the entrance of the shrine. Both are similar in many attributes, standing in tribhanga posture, slightly turned towards the shrine. One hand is on waist and another hand is hanging sideway to the club. The handle of the club is into their armpits. Inscriptions of the cave – No inscriptions found in this cave. Cave No 3 – This is the northern most cave among the three caves at Vallam. This cave is dedicated to Vishnu and locally known as Karivartharaja Perumal temple. A simple creation, without any mandapa, a cell is cut into the vertical farce of the rock. This vertical farce allows provisions for dvarpalas on side. Though there is no pillars and pilasters, however we see a simulation of corbel style though without any support of the pillars. The corbels are angular here. K R Srinivasan suggests that perhaps the pillars were broken or removed, however I feel that there were never pillars in this cave. If you see the total area of the cave, between the front corbel and the back wall, the space does not seem enough to have the pillars, as if provided then it will leave very less space for movement. Hence they tried to get the frontal appearance similar as seen in other caves, however with no pillars. As there is a modern floor constructed so it’s hard to see if there are any remains of the pillar bases. Central cell has an image of Vishnu with his two consorts, a later addition of course. On the northern end, beyond the dvarpala, is a relief sculpture of Durga. She is totally blackened with continuous anointment of oil, hence her original features are not very clear. She is standing in sambhaga posture. In her four hands, she carries a shankha and chakra in upper two hands. One lower hand is on her waist and other lower hand is in abhaya mudra. We have seen Durga images in other Vishnu temples of the Pallavas, such as in Singavaram Cave Temple , Adi-Varaha Cave Temple , Mahishasurmardini Cave, Trimurti Cave, Varaha Cave all at Mahabalipuram. In most of these places, Durga is shown as Mahishasurmardini, except at Varaha Cave and Draupadi Ratha where the theme is Kotavarai. This image here, looks similar to the Draupadi Ratha in appearance, however one in Draupadi Ratha is quite elaborate and ornamented and the theme is also different. K R Srinivasan suggests that this cave has been excavated probably after the time of Rajasimha (700-728 CE). His main argument is because of slender pillars, though these are missing now. However I feel why anyone will executed such a simple plan, though we have few elaborate caves in the time of Mahendra (580-630 CE) itself. Hence I think that though it does not have a characteristic mandapa style of the Pallavas, however it could be a creation of some local chiefs who were under the Pallavas. As Pallavas were in continuous fight with the Chalukyas, it might be very probably that many of the nearby places of Kanchi were with local chiefs which though under Pallavas were affected by the warfare and hence influenced with the art and architecture of the invaders. On north it was Chalukyas, and south it was Pandyas and the Cholas. Hence presence of rock-cut shrines which differ from characteristic Pallava art in Pallava region might be due to these factors. Dvarpalas of the cave – The dvarapalas here are somewhat similar to the dvarapalas of the inner shrine of Dalavanur Cave Temple. 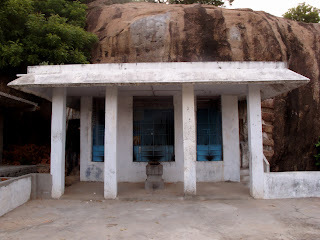 However where Dalavanur is a Shiva temple, this cave here is dedicated to Vishnu. Both the dvarapalas here are similar in appearance, standing in tribhanga posture, slightly turned towards the shrine. One hand is on their waist and one hand is raised in adoration. They are wearing a patra-kundala and a makara-kundala in their ears. Both are standing on slightly raised platform. Inscriptions of the cave – There is no inscription found in this cave. How to Reach – Vallam is about 2 km from Chengalpattu, located on Chengalpattu-Mahabalipuram road. There is a small board, on your left side, where is a road going inside to the rock-cut shrines. On this road, Vallam Church is also located. Chengalpattu is a big town, which can be easily reached from Kanchi or Chennai.